Important Maths Formulas and Tricks for SSC CGL 2016. Free Download pdf Quantitative Aptitude for SSC. Maths Shortcuts for Competitive Exams 2016. Free preparation material for competitive exams Tier 1 and Tier 2 Exam 2016. You can also get GK Tricks. Examples: (i) 5! = (5x 4 x 3 x 2 x 1) = 120; (ii) 4! = (4x3x2x1) = 24 etc. We define, 0! = 1. 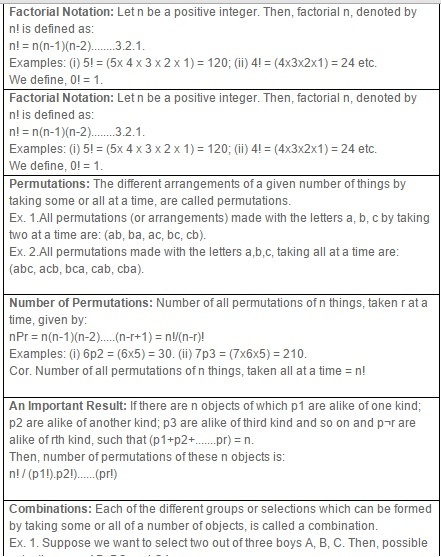 Permutations: The different arrangements of a given number of things by taking some or all at a time, are called permutations. Ex. 1.All permutations (or arrangements) made with the letters a, b, c by taking two at a time are: (ab, ba, ac, bc, cb). (abc, acb, bca, cab, cba). nPr = n(n-1)(n-2).....(n-r+1) = n!/(n-r)! Examples: (i) 6p2 = (6x5) = 30. (ii) 7p3 = (7x6x5) = 210. Cor. Number of all permutations of n things, taken all at a time = n! An Important Result: If there are n objects of which p1 are alike of one kind; p2 are alike of another kind; p3 are alike of third kind and so on and p¬r are alike of rth kind, such that (p1+p2+.......pr) = n.
Combinations: Each of the different groups or selections which can be formed by taking some or all of a number of objects, is called a combination. Ex. 1. Suppose we want to select two out of three boys A, B, C. Then, possible selections are AB, BC and CA. Note that AB and BA represent the same selection. Ex. 2. All the combinations formed by a, b, c, taking two at a time are ab, bc, ca. Ex. 3. The only combination that can be formed of three letters a, b, c taken all at a time is abc. AB, AC, AD, BC, BD, CD. nCr = n! / (r!)(n-r)! = n(n-1)(n-2).....to r factors / r! Note that: ncr ¬ = 1 and nc0 = 1. An Important Result: ncr = nc(n-r). Example: (i) 11c4 = (11x10x9x8)/(4x3x2x1) = 330. (ii) 16c13 = 16c(16-13) = 16x15x14/3! = 16x15x14/3x2x1 = 560.